It was 2007 when I first had the opportunity to interview Philip Moraeu. Ireland was in the height of madness, and only the canny and the cute were making provision for what we now recognise as the inevitable. At 61, Philip has seen it all before. A highly respected grower and businessman, he has built a deserved reputation for not mincing his words, and tireless campaigning for the sector. It was with great pleasure that I had the opportunity to revisit that interview and to find out exactly what’s happening with Ireland’s growers in 2014. B: You commented in 2007 that one of the most significant changes to occur in the nursery sector in the last 30 years was the shift in emphasis from production to marketing, and the necessity to focus on the science of selling not growing. Do you think the sector has responded appropriately to this shift in emphasis? P. Since that time the tide has come in and gone out, but the emphasis remains the same. Nursery owners can’t expect anything to sell simply because it was grown. They need to focus on marketing their products more than ever, packaging them with the right labelling and presentation. In reality, most nurseries are struggling to make ends-meet, and are not adapting to change. Take retail stocking for example. In days gone by, centres would be fully stocked over the winter period. What wasn’t sold in autumn would be carried over and sold in the spring. That just doesn’t happen anymore. Centres clear out their holding in Autumn and focus on other areas like coffee and Christmas. And who could blame them? This is has left a big gap in the nursery calendar. The smarter production people are doing likewise. They’re either using the quiet period for holidays or preparation, or they’re exploring other opportunities to make money. B. Following from the last question. How do you feel the sector should adapt to the threats and opportunities presented by the internet? P. I’m a granddad at this stuff! Previously I was sceptical about the internet and how the touchy feely aspects of plant purchase could be catered for. But when you look at the figures – 56 billion spent on line in the UK last year – and note the big UK chains making heavy investments on ideas such as ‘Click and Collect’, you know it’s time to take notice. Recently, Waitrose teamed up with Crocus and they’ve signed Alan Titchmarsh to front their offering. We may think plants are immune to the internet. They are not. People are getting lazy in many ways. It’s easy to buy online from comfort of your home. It’s easier to sell online with pictures of a plant at different stages of growth. You can emphasize the positive points, provide extra information, accessories, associated products and plants, and it doesn’t matter what country you’re in, or where the plants come from. Compare that to trying to sell a bundle of sticks in the off-season at the local garden centre! The writing I on the wall. B. Okay, but what is Glenbrook doing to ensure it’s keeping up with the change? P. Suffering like all the other nurseries! We’re working on several fronts. We’re developing a new niche range for the Irish market. We’re refocusing on the Irish market as transport costs to the UK are making it less attractive. In terms of the internet, we’re doing what we do best, grow plants. But we’re finding partners and resellers who are more knowledgeable and better placed to do what they do best, sell. B. At a conference in 2007 you stated that the nursery sector had 20 years left at best. Do you stand over this? P. That was 2000 when I said that! In the 60’s and 70’s there were a handful of nursery operation; McLasaghts, Rentes, Costins, Mount Congreave, Eamonn O’Carroll and a few others. Looking back, we were in recession then too, and I often think about that time and wonder what was different? They were small businesses, run by people with primary production skills. Family run businesses, more akin to the operations you see in Southern Holland. The Celtic Tiger confused the sector, many tried to expand and many more bought vans and called themselves landscapers too. There were many lessons learned the hard way. There will be a nursery sector in the future, but I think it will look more like it did back in the 70s. Smaller, more adaptable businesses with general offering. B. 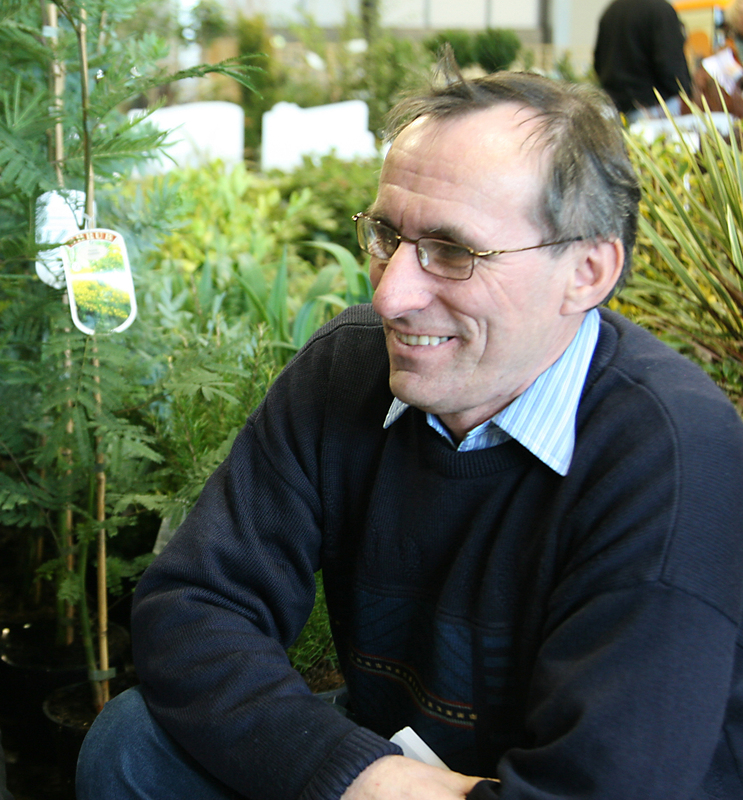 Poor cooperation still remains a fundamental stumbling block to delivering a coherent strategy for Irish Horticulture; back in 2007, you said, ‘There is very little communication between the different sectors of the industry and it’s no surprise that people pick up the phone and dial Holland first’. Should we just accept we don’t communicate and come up with other ideas, or do you think there’s a mechanism that will help us address this perennial problem? P. No change there! The perception that’s it’s still easier to call Holland is still the dominant one. In my opinion there is absolutely no point in sitting around tables. The only way the industry will be united is via a commercial operator. We need a private entrepreneur to identify how a profit can be made from pulling things together, and they will have to find a way to evangel growers to participate. From the grower end, we need to recognise that there is more to be had from sacrificing a small percentage of the margin for the bigger picture. B. One of the other significant problems you identified at the time was the lack of focused business thinking. ‘Most are hobbyists and part-timers who do what they do because they enjoy being around plants’. Has the sector moved on? P. Yes, It has moved on. If the last few years have thought us anything, it’s that this is not an easy sector to make money. Many people had their wings clipped, but I think we’re operating in a more sensible environment. Most growers have their feet firmly on the ground and this is reflected in better business practices. B. You previously mentioned the element of greed as something which undermines the sector. Can you expand on this and explain how it manifests in sector practice? P. The bubble perpetuated greed and begrudgary. Many people were out to make a killing, nowadays they’re simply trying to make a living, to make ends meet. Our crash landing back to earth has made us all think and act differently. B. Bloom is possibly the most significant positive initiative to be introduced since my last interview with you. How could the industry better exploit the opportunities it affords? P. I very much believe in advertising and I am greatly saddened that the sector has not joined forces to utilise the amazing opportunity of Bloom to promote what Irish growers do. We tried it in year one, then everyone wanted to do their own thing the following year. They all saw it as an opportunity to sell plants, but the figures don’t stack up. They missed the point. We should have one industry tent focused on promotion not selling. It’s not about getting a few quid selling to the public, it’s about promotion, a bigger picture, getting what we do under the noses of the punters. With a little joined up thinking with retailers, we can all be winners. But everyone says they are too busy that weekend. Nonsense. B. Many other countries have flexible labour and wage regulations that respond to seasonal sectors such as ours. I know the subject has always been a topic of interest for you. Has anything changed on the employment landscape to provide hope? P. Nothing has changed, absolutely nothing. B. Following from the last question; what changes would you make in this area to facilitate the sector? P. A the very minimum we should be looking at minimum wage and the introduction of a sliding scale. Such a scale would encourage younger workers to engage in seasonal work, which also corresponds with holidays. The scale would also recognised and take account of skill levels. If they can do it elsewhere in Europe why can’t we? B. Leaving aside the banking debacle, what do you feel have been the most significant changes to impact the industry over the last six years? P. The department of agriculture’s handling of compensation for the impact of weather was a disgrace. We were left to hang, loosing half a million Euro of stock in two weeks. We got nothing. The grant system has no mechanism for recognising the capital shortfall in business. How could a business utilise a partial grant when they can hardly meet the weekly wage bill? Ridiculus. On a more positive note, the potential introduction of green zones by Europe for local councils, which require trees and shrubs, rather than the usual lawn, may have a good impact on the industry in the coming years. Leaving aside money and the EU, the most significant impact has been the weather. A succession of wet summers, two freezing winters and a very bad spring brought us to our knees. Summer 2013 was great, too great, nobody gardened, and they all went to the beach. We need a little bit of sun, enough cloud to keep people off the beach and some rain at night! B. ‘Of all of the issues facing the industry, it is the ageing profile that is the most worrying’. Baring this comment in mind, what do you think the hundreds of horticulture students are doing after graduation each year? P. I have no idea where they are going or what they are doing. I’ve had no contact from colleges at all. I placed a recruitment ad last year and had great trouble filling the post. B. The last six years are perhaps the toughest the industry has experienced, but there is some talk of the tide turning. What’s your sense of the current market? Well, things can’t get much worse! The next two years are sure to tell an interesting story. I think landscape is dead for now, but possible EU directives may shake things up. In fairness, I do think things have turned, a little, but there is still room for further contraction and rationalisation. That said, there is certainly scope for import substitution and that’s where the smart money is going. B. Glas Ireland was introduced to fill the vacuum left by the Kildare Growers Trade Show. It would appear to be gaining a solid foot hold. How would you like to see it develop? P. Glas is a good show at the wrong time of year. I said it before and I’ll say it again, it needs to be held in either February/March or September. I do not think it is as well attended as the Goff days, and in particular, the retail sector is poorly represented. They have had a tough time over the last few years but they should increase their involvement. As it stands, Glas Ireland is a social event, not a business one. To my knowledge there is very little business done there. B. What advice would you give to someone wishing to pursue a career in the sector? P. Cop on to themselves! But seriously, it is a good business to be in in many ways. It’s a family business rather than a financial, commercial one. The friends and colleagues I had forty years ago are still the same ones I have today. That says a lot about the sector. The most significant things for newcomers to be aware of include the level of investment required. In days gone by most nurseries started with a small plot of land and a polytunnel, but those are long gone. You need a good level of starting capital, but once you have it you can take advantage of available grants, which effectively translate into a 40% reduction in investment costs. Another significant thing to acknowledge is competition. You simply cannot compete with the industrial, mechanised operations so you better have a niche to exploit. I would encourage people into the sector, but I’d caution them to have their eyes wide open. B. If you could wave of a wand and change anything about the sector, what would it be? P. It’s very simple, two things; firstly there would be an independent trading company that pulls everything together in one place. Secondly, the education programme for horticulture would be linked right through to industry and the advisory services. This is achieved very successfully in places like the US, there’s no reason why we can’t have it too. I said the same thing to Minister Coveney recently. B. In 2007 you said you’d retire within the decade. Surely not? P. Absolutely not. Provided nothing breaks or falls off, I’d like to think I’ll still be working at 75. I’d also like to think I’ll be bolder, more brazen and a lot crankier.